You don´t leave anything to chance? And do you like to have everything you need? Then our popular individual ration pack according to the German Armed Forces standard are just right for you. These are now available in 60 variants. The light power pack with immediately consumable food, for a whole day full of power. 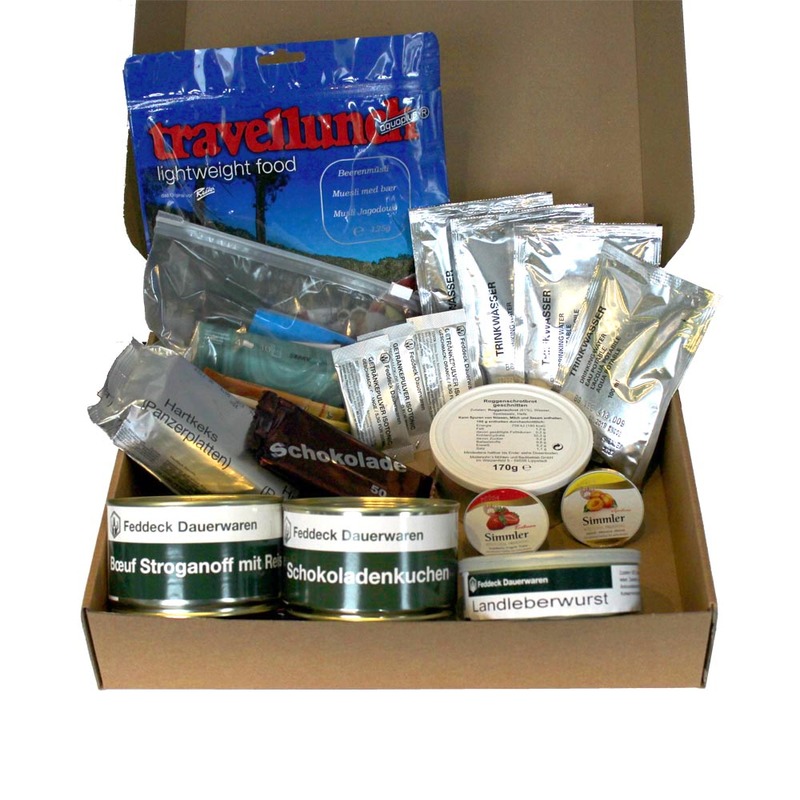 The long-term individual ration pack is characterized by a longer durability considering the canned articles and is equipped with high-quality food. It is intended for the catering of a person for one day. 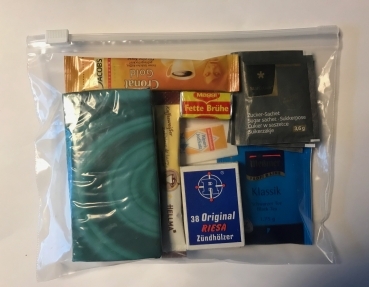 The average nutritional value of the individual ration pack is approximately 3,300 Kcal. The weight of a day package is 2.0 kg (gross). 1 x canned ready- meal , Beef roulade, 400 g, Ingredients: 65 % Beef, bacon, onions, pickled cucumbers, carrots, rapeseed oil, cream, whole milk, wheat flour, potatoes, spirits vinegar, pepper, salt, spices. 1 x Canned Cake, Chocolate cake, baked in the tin, 200 g, Ingredients: Wheat flour, sugar, butter, whole milk, whole egg, chocolate 20%, cocoa portion 11%, cocoa powder, baking powder (baking agent sodium bicarbonate). Contains traces of milk constituents as well as nuts and other oilseeds. 1 x Canned Country Mettwurst, 200 g, Ingredients: 85% pork, bacon, water, food salt, spices, antioxidant: ascorbic acid, stabilizer: biphosphate, preservative: sodium nitrite E250. Ingredients: Oatmeal, apple pieces, skimmed milk powder, sugar, dried fruit mixture in varying proportions (freeze-dried strawberry pieces 4%, freeze-dried raspberry pieces 1%), sunflower seeds, Spelt flakes, wheat flakes. Alergene: Contains gluten, milk. ingredients: soft wheat floar, sugar, partially hydrogenated sunflower fat, glucose, salt, raising agents (sodium bicarbonate, ammonium bicarbonate), antioxidants: sodium metasulfite). May contain traces of soy, egg, milk and sesame. Ingredients: Wholegrain rye (61%), water, salt, yeast. May contain traces of nuts, milk and sesam. Ingredients: Sugar, cocoa mass, cocoa butter, emulsifier: soy lecithin, flavor: vanillin. Cocoa (at least 45%). May contain traces of nuts, milk products and gluten (wheat). 3 x 5,3 g Drinking powder isotonic Orange (with sugars and sweetener), 1 Portion for 200 mL drink. ingredients: Dextrose, dextrine, sodium chloride, sodium hydrogen carbonate, acidifier: citric acid, potassium chloride, flavor, seperator: silicium dioxide, beetroot juice powder (maltodextrine, beetroot juice powder), sweetener: aspartam, colouring: riboflavin-5'-phosphate-sodium. With sugars and sweetener. Contains a source of phenyl alanin : aspartam. ** Reference quantity for daily amount referred to regulation (EU) No. 1169/2011 of the European Parlament. *** Nutrients less than 15% RM/portion are not considered as significant amount and should therefore not be announced. For contents and nutritional values, please refer to the individual packages. The individual articles are predominantly air- and water-tight packaged. The Zipper closure bag is used as a waterproof packing for the other products! Pictures can defer from original. The chocolate is a free addition. Because it does not have the BB-date mark, but the date of production is the 2/2015, it is declared as a collector's item. The chocolate is however at least durable until 02/2020. Almost all items are individually sealed. For the rest, the zipper bag serves as a waterproof packing! Please refer to the individual packaging for details.